On Saturday July 30th Avalon held it's annual Summer Sale and Faery Festival. It was a hot day. Six or so crafts vendor tents were set up in the parking lot next to Avalon (1211 Hillcrest Street.) Faria Maieed was painting a henna dolphin on a little girls hand as her father watched. I contemplated a sketch but the dolphin was almost complete. People were relaxing on massage benches. The massage looked particularly tempting. I went inside Avalon and looked at the wide array of crystals, spices, enchanted crafts and incense. The store wasn't as crowded as it was last year so it was easy to browse. Back outside, Florida Tribal Dancers were gathering in one of the tents. People started gathering in a semi circle around them in anticipation of a performance. I set up my stool in the shade of a tree and started blocking in a sketch. Lacey Sanchez, dressed in her gorgeous blue tribal dress, asked the assembling crowd to back up to give the dancers room to perform. Once the dancers came out, people stood right in front of me. I had to move out onto the hot pavement to re-start the sketch. 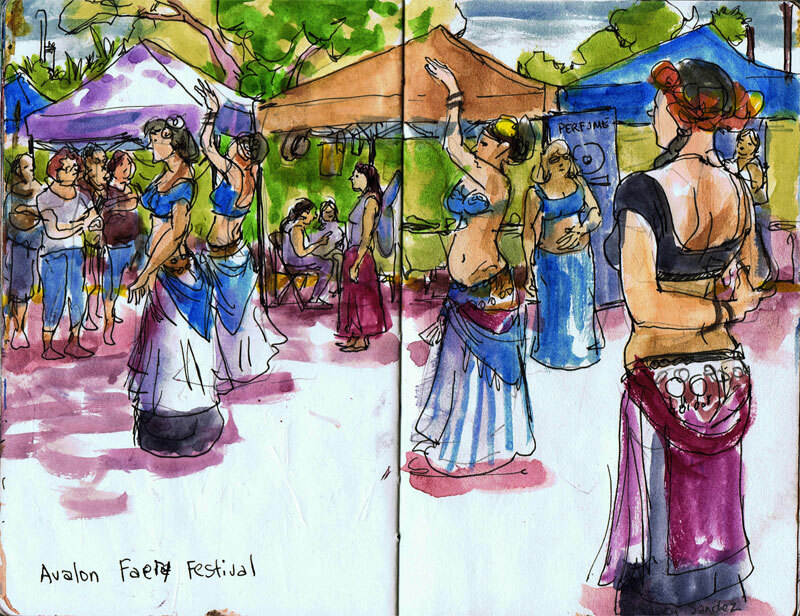 I had to sketch quickly since the dancers twirled constantly. A huge gust of wind lifted one of the tents and people caught it's poles to keep it from toppling. Lauren E. Lee pointed to the sky. I glanced up as a clear plastic bag danced in the wind swiftly rising up towards the clouds. When the performance was done, I was still adding color washes to the sketch. A woman walked up behind me and said, "You're neck is going to be crisp as a lobsters hide if you keep sitting in the sun." After I assured her I would be done soon, another woman approached and warned me about skin cancer. I was getting annoyed since in an ideal world I would of course be sitting in the shade, but life keeps pulling me out into the sun.